In just a few short days we will be on the ground in Las Vegas, Nevada at the 50th annual Consumer Electronics Show. The range of technology highlighted at CES runs across the spectrum and the trade show is the platform for many manufacturers, established and start-ups, to feature emerging and cutting edge technology from every market imaginable. Chrome OS may be a tiny drop in the bucket in the grand scheme of things that is CES but that doesn’t mean we don’t have a lot to be excited about. Last year, at CES 2016, we saw the release of notable Chromebooks like the Lenovo ThinkPad 13 and the Samsung 3. Not exactly game-changers, but mainstays in the world of Chrome OS none-the-less. This year there is a bit of a different buzz in the room for Chromebooks. The pending onslaught of new and never before seen hardware configurations and designs could leave Chrome OS stealing the show in its own right. We thought we’d take a few moments and share what Chromebooks we can expect to see in Vegas next week. So, let’s get started. We’ve been hot on the heels of this device for months now and as many of you know the new ASUS convertible has recently been made unofficially official. Originally listed back in November, the C302CA has yet to be made official by ASUS and has seen a number of site offering it up for sale but none with a solid availability in sight; that is until this past week. Newegg “accidentally” listed the Chromebook but quickly removed it and cancelled any and all orders that we were aware of. However, Best Buy’s similar slip-up has bore more fruit as the ASUS has indeed shipped to customers before the retailer pulled the listing from their site. We have one on the way and look forward to getting an early preview of the device. We were given word that the official release of this device is January 5th which happens to be the opening day to the public for CES. I am anxious to see just how many configurations of the ASUS are going to be available and at what price point. Stay tuned for an unboxing of this one very, very soon. 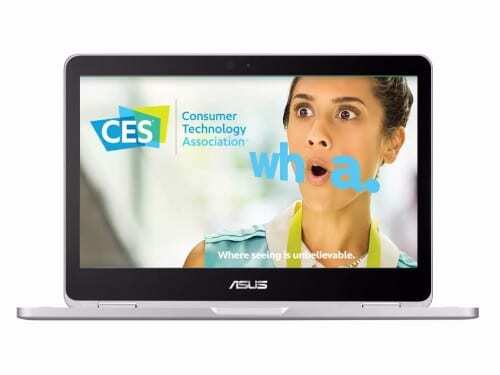 It is possible that we may hear the announcement of a lesser ASUS Chromebook as well. We have been watching the development of ‘Bob’, a RockChip-powered device we believe will be a new model comparable to the original Flip. This one’s pretty exciting and while I’d love to see it first-hand, I don’t think we will get a look at a working model of this device. We suspected this Chromebook was in the works for quite some time but it was just made really, really official a few weeks ago. With the development of a device of this type being still very new, it’s more likely we will see a prototype if anything at all. The YogaBook is definitely on our most-wanted list but that’s not the only thing Lenovo has working for the new year. Last year’s CES saw the release of the Lenovo ThinkPad 13 PC and it’s Chrome OS counterpart. Lenovo showed off an early preview of its refreshed line of Windows laptops, so it is possible we will see an update to last years Chromebook Thinkpad 13. We’ve also been tracking two variations of what we are confident are new models of the ThinkPad Yoga. Focused on the education market, the new convertibles aren’t just your everyday makeover. These are Apollo Lake-based touchscreen devices, making them the first with the newest Intel Atom chip . One of them even appears to be sporting a stylus. This could have the makings of an unprecedented release of new Chrome OS devices for a manufacturer at CES. Stay tuned as we report live from Las Vegas on what’s new with Lenovo. Here it is. The question we’ve all been asking. Will we see the elusive Samsung Chromebook Pro next week at CES? Samsung is a big player at CES and we will be present at the media-only press conference being held Wednesday afternoon. CES 2016 saw the release of the Samsung 3 and we are excited to see if this year’s show will usher in this next-generation Chromebook. With all the markets that Samsung has their hands in it’s like the Pro wouldn’t be center-stage of their presentation. However, the stylus-weilding Samsung isn’t your everyday Chromebook. If ever there were a time and place for it to make its debut, it is CES. One things for sure, we will be on the edge of our seats and as soon as we know, so will you. It’s been some time since Dell put out a new Chrome OS device and we’re pretty positive some new goodies are in the works. We have received an inside tip that a Dell device has already made its way into the wild. If the rumors are true and the Kaby Lake Chromebook is real it could make an appearance at the trade show. This would likely be the first sighting of a Chrome OS device with the 7th generation Intel chipsets. Many of you have probably never heard this name but Epik has been a formidable player in the education market and they will be present this year in full force. They offer a wide range of computing devices for schools and will assuredly have their Chromebook line-up polished and ready to show off. Another well known name among educators, Sector 5 has recently announced a new generation of their rugged convertible the E2. These guys will be setup in Vegas and I can’t imagine the new device, which is being touted for having Play Store access, not being there. From the flurry of emails from the CES media room, it looks like Alexa will take the helm when it comes to IoT this year. The release of the Google Assistant SDK for third parties has only been public for a few weeks at best. The chances of seeing any Google-driven devices are slim but you can bet we will find them if they’re around. Chrome Unboxed will be covering CES Las Vegas live and in person. Stay on top of all the Chrome OS news by subscribing here. You can check us out on social in the links below and keep tabs on us as we make our way to Las Vegas.